This section gives a brief UNIGINE overview from a Unity user's perspective and provides basic information to help you transfer your Unity experience to UNIGINE. In the images below you can see interfaces of the Unity Editor and UnigineEditor. Interface elements on the images are color-coded to indicate common functionality. Each element has a label to show UNIGINE's equivalent. UnigineEditor's layout is fully customizable by resizing, dragging and dropping the tabbed windows. To learn more about the UnigineEditor interface please see this article. The concept of the Scene in both engines is the same. However, Unity3D and UNIGINE use different coordinate systems. 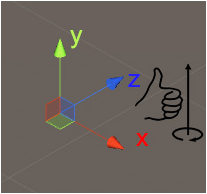 Unity uses a left-handed coordinate system - where the vertical direction is usually represented by the +Y axis. Positive rotation angle sets the rotation clockwise. 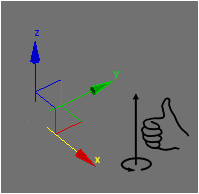 UNIGINE uses a right-handed coordinate system - where the vertical direction is usually represented by the +Z axis. Positive rotation angle sets the rotation counterclockwise. This section will give you a brief description of basic scene objects in both engines as well as their basic similarities and differences. Basic scene object – GameObject. GameObjects are containers for all other Components. It has a Transform component by default. Components add functionality to the GameObject. GameObjects can be organized into a hierarchy (parent-child relation). Node is a basic type from which all types of scene objects are inherited. Some of them appear visually: Objects, Decals, and Effects they all have surfaces to represent their geometry (mesh), while others (Light Sources, Players, etc.) are invisible. Basic functionality of a node is determined by its type. Additional functionality can be added using properties and custom component system. Each node has a transformation matrix, which encodes its position, rotation, and scale in the world. Nodes can also be organized into a hierarchy (parent-child relation). All scene objects added to the scene regardless of their type are called nodes. This chapter matches common Unity terms on the left and their UNIGINE equivalents (or rough equivalent) on the right. UNIGINE keywords are linked directly to related articles to provide you with more in-depth information. A project in UNIGINE, just like a Unity project, is stored in its own folder, project settings are stored in the *.project file. There are various subfolders inside the project's folder, where your content and source files as well as various configuration files and binaries are stored. The most important are the data and source sub-folders. In UNIGINE, each project has a data folder. Similar to a Unity project's Assets folder, this is where your project's assets are stored. To import assets into your project, simply drop files into your project's data directory and they will be automatically imported and appear in the Asset Browser. The assets in the editor will update automatically as you make changes to the files using an external program. Unity supports a wide range of file formats, while UNIGINE supports the ones most commonly used. In Unity you got used to assembling your projects via the editor. In UNIGINE all projects are managed via the specialized tool called SDK Browser. Assembling a Project via SDK Browser. Game logic in a Unity project is implemented via Script components. You got used to determine GameObject's behavior by writing event functions like Start(), Update() etc. UNIGINE has quite a similar concept. Each component has a set of functions (init(), update(), etc. ), that are called by the corresponding functions of the Engine's main loop. So, you implement logic, by writing your code inside the init(), update() etc. In UNIGINE you can do it either for each component individually, like in Unity, or for the whole application. The workflow in Unity's is based on prefabs. It is usual for you to assemble a complex object from GameObjects with certain components and properties and then creating a prefab from them. Prefabs can then be placed in your world via the Editor, or instantiated at run time. UNIGINE's workflow is based on Node References which are very similar to prefabs. In order to make a complex object to be instanced in your world, you just build the desired hierarchy from nodes, assign materials and properties to them, and save it as a Node Reference. Then you can use this node reference as many times as necessary, and just like with the prefabs, you can modify the node reference by changing any of its instances. Node References support nesting, so you can build complex hirarchies easily!